So I'm gonna start by saying that sweet sixteen me probably would have had each nail painted a different color, because that made me funky or something. BUT the mani I loved most (though I could never do it myself, especially since I used to bite my nails) was a French manicure. I absolutely loved getting tips on for special occasions. Looking back at it... Yeah, not too big a fan anymore haha. I used to be a nail biter too (in elementary school though). French tips were always my favorite. 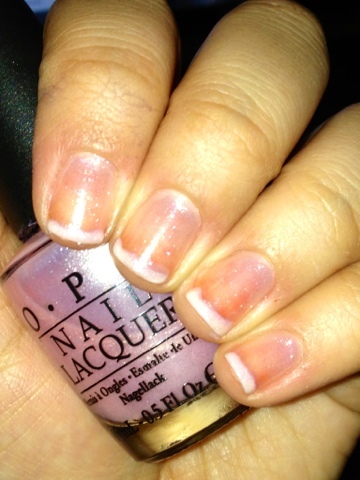 Love the opi over top! love the extra bit of sparkle on top!